Ogre dancers at Taga Taisha Setsubun. 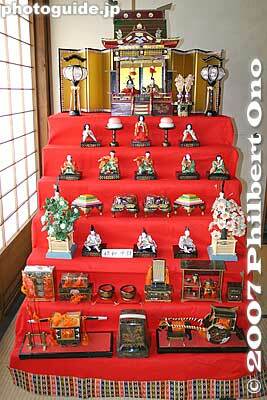 February 3 is the Setsubun Festival at many temples and shrines in Japan. 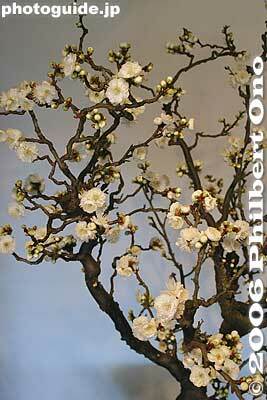 It marks the beginning of spring (Feb. 4) according to the lunar calendar. They hold a religious ceremony and then throw fuku-mame lucky beans (dry soybeans) for worshippers to catch. They may also throw beans at ogre (oni) to chase away evil and bad luck (symbolized by the oni) and bring in good fortune (fuku). They usually shout, “Oni wa soto! Fuku wa uchi!” (鬼は外! 福は内! Out with bad luck! In with good fortune!). The bean-throwing is called mame-maki. 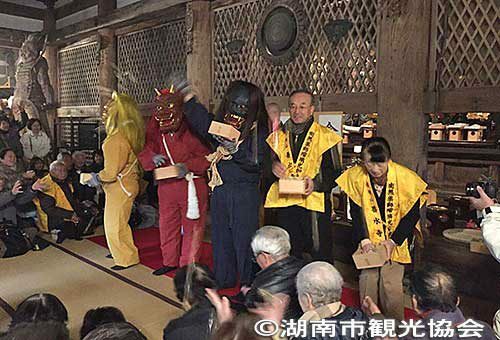 Like giving New Year’s prayers, Setsubun is a popular event because many people want to eliminate misfortune and invite good fortune to come in the new year. In Shiga Prefecture, you can see the Setsubun festival on February 3 at the following temples and shrines. There may be slight variations in how they conduct the Setsubun festival. 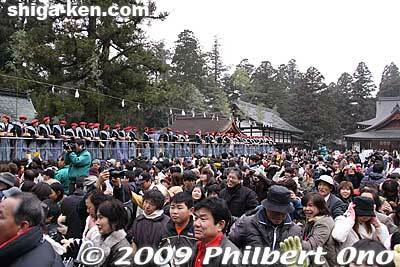 You don’t have to be Buddhist to see or participate in Setsubun (or any other Buddhist events in Japan). Just make sure to dress warmly and enjoy one of Japan’s major traditions. Catching lucky beans at Taga Taisha. Shiga’s biggest Setsubun festival is in Taga. 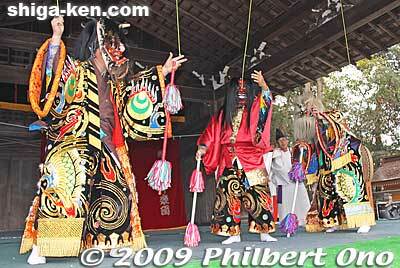 They have impressive ogre (oni) dancers from Shimane Prefecture to act as the evil demons to be chased away. They will hold two bean-throwing (mame-maki) sessions. Expect a large crowd. It starts with a religious ceremony in the shrine’s worship hall. The shrine’s outdoor stage will then show a dramatic performance by the ogres as they are chased away by priests throwing beans at them. The main event is when over 300 people born under the current year’s Oriental zodiac begin to throw soybeans and mochi to the crowd. The soybeans are thrown in little paper bags, so they won’t get dirty if they fall to the ground. But the mochi are hard as a rock, so watch out. The bean-throwing is fun, but potentially dangerous with beans or mochi hitting your face/head and people shoving you around. Better to not pick up beans/mochi on the ground amid the jostling. Taking pictures is pretty risky as well. One mochi even hit my camera lens. Fortunately, no damage. You should always look up and see where the mochi and beans are flying. Directions: Taga Taisha is a short walk from Ohmi Railways Taga Taisha-mae Station on the Taga Line. Throwing beans at Zensuiji Setsubun-e.
Belonging to the Tendai Buddhist sect, Zensuiji temple is a National Treasure and one of the Konan Sanzan Temple Trio worth visiting at any time of the year. Their Setsubun festival is somewhat unique since it is held entirely inside the temple. It starts at 1:30 pm with priests chanting and the Goma fire ritual (護摩供奉修) with a small fire inside the temple burning worshippers’ wooden prayer sticks (write your wishes on the stick, ¥500 per stick). Instead of chasing away the ogres, the priest uses the power of Buddha to neutralize their poison hearts. Each of the three poisons have an antidote, such as knowledge to quell ignorance. All the ogres acquiesce and are thereby converted into “good” ogres. At around 3 pm, the good ogres, priests, and other folks throw beans while shouting, “Fuku wa uchi! Oni mo uchi!” (福は内! 鬼も内! In with good fortune! In with ogres!). This is another unusual thing about Zensuiji’s Setsubun festival, they also welcome the ogres. But they are now good ogres. At the end of the festival, worshippers can have one of the three ogres eliminate their respective poison. The ogre taps the person to cleanse his/her poison. Very interesting Setsubun festival. Photography is permitted. Directions: From JR Kosei Station on the JR Kusatsu Line, catch a bus bound for Shimoda (下田) and get off at Iwane (岩根). From there, walk up the hill, and follow the signs (if you can read Japanese). A small temple admission is charged. Photos courtesy of Konan Tourism Association (湖南市観光協会). 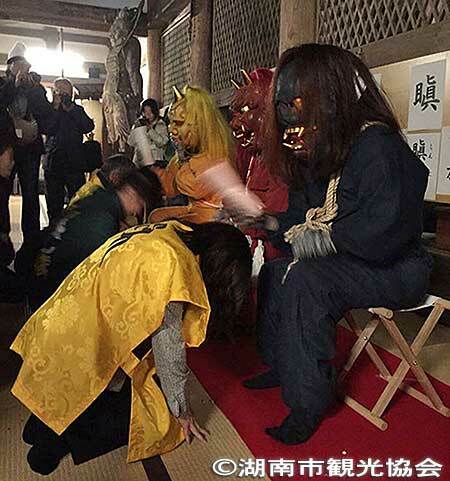 Good ogres cleanse worshippers’ poisons at Zensuiji’s Setsubun. Men and women born under the current year’s zodiac animal will throw beans three times on this day. Free ama-zake (sweet sake) and locally brewed sacred sake will be served to visitors. The shrine’s mikuji paper fortunes (sold for ¥200) will also be used in a drawing for many prizes. Directions: 15-min. walk from JR Kusatsu Station‘s east exit (or take the Mame bus and get off at Tachiki Jinja-mae). Minakuchi Shrine’s Setsubun festival is mainly held in the evening from 7 pm when they hold a religious ceremony, perform a lion dance, chase away ogres, and throw lucky beans and mochi. From 3 pm to 7 pm, udon noodles and red bean soup (zenzai) will be available to warm you up. 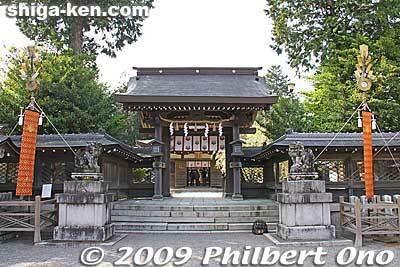 The shrine is most famous for the Minakuchi Hikiyama Matsuri in April. Wishing everyone good fortune this new year! Pharrell Williams scored a huge hit with his song Happy last autumn. It has since become a worldwide phenomenon with people in cities around the world making street dance videos with the song. Pretty amazing. The videos show a good bit of the respective locality along with some great dancers. The vids were inspired by Pharrell’s own music video which is the world’s first 24-hour music video with Happy played repeatedly for 24 hours. Fortunately, we can pause and resume the video at will. I’m not one who usually gets on a faddish bandwagon, but I immediately recognized Happy’s PR potential for local destinations. So I hopped aboard by making this Shiga matsuri version of Happy. (Video embedded above or click on the video link.) Matsuri is Japan’s most common and colorful way to express happiness in public. Many matsuri also includes dancing and happy motions. A great match for the Happy song. I’ve always wanted to make a compilation of my Shiga matsuri videos and this is a great way to do it. 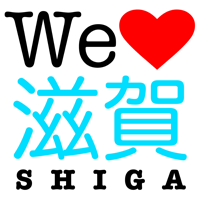 Shiga has so many matsuri that I ended up making the video with the song repeated four times. Even then, I still couldn’t fit all my Shiga matsuri videos. A few are missing. Most of the footage have already appeared in my other videos already on online, but a few clips are online for the first time like the Otsu Matsuri shot in Oct. 2013. Painting “yorokobu” (喜) kanji meaning “happy” on Yokaichi giant kite.